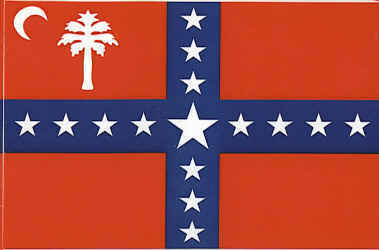 On December 17, the convention called by the South Carolina Legislature to consider secession began. Participants listened to speeches concerning the political crisis. The convention was to be held in Columbia, but it was moved to Charleston because of a smallpox outbreak in Columbia. See James M. McPherson’s Battle Cry of Freedom , p. 235. “Our greatest danger at this moment arises from the mutual ignorance of the South and the North of each other’s real feelings and purposes. . . . The North is not really hostile to the South whatever party presses and party leaders have induced the South to think. . . . great mistakes have been made, and great mischiefs have been done by both parties. . . . [T]he country is on the brink of disunion, and of disaster and misery of which no man can measure the magnitude or foretell the end.” Quoted in Maury Klein’s Days of Defiance: Sumter, Secession, and the Coming of the Civil War (1999), p. 123.
proclaimed it to the impatient populace. The bells in every steeple rang out the news. Poetry and Eloquence from the Blue and the Gray, Francis Trevelyan Miller, ed., p. 45 (1957). Later that day, James L. Petigru, one of the few people in South Carolina who opposed secession, was walking down Broad Street in Charleston when he heard all the bells of the city ringing. When he bumped into a friend on the street, he asked, dryly, “Where’s the fire?” No fire, the friend replied, just celebrating news of the state’s secession. Petigru replied, “I tell you there is a fire. They have this day set a blazing torch to the temple of constitutional liberty and, please God, we shall have no more peace forever.” Then Petrigru turned and walked away. From The Coming Fury, Bruce Catton, pp. 133-34. This is the man who, two weeks earlier, on December 8, had written a friend, “South Carolina is too small for a republic, but too large for an insane asylum.” Quoted in James M. McPherson, Drawn with the Sword: Reflections on the American Civil War (New York: Oxford University Press, 1996), p. 37, citing Lacy K. Ford, Jr., Origins of Southern Radicalism: The South Carolina Upcountry, 1800-1860 (New York, 1988), p. 371.